We will be meeting at 9:30am so we can gather everyone together. 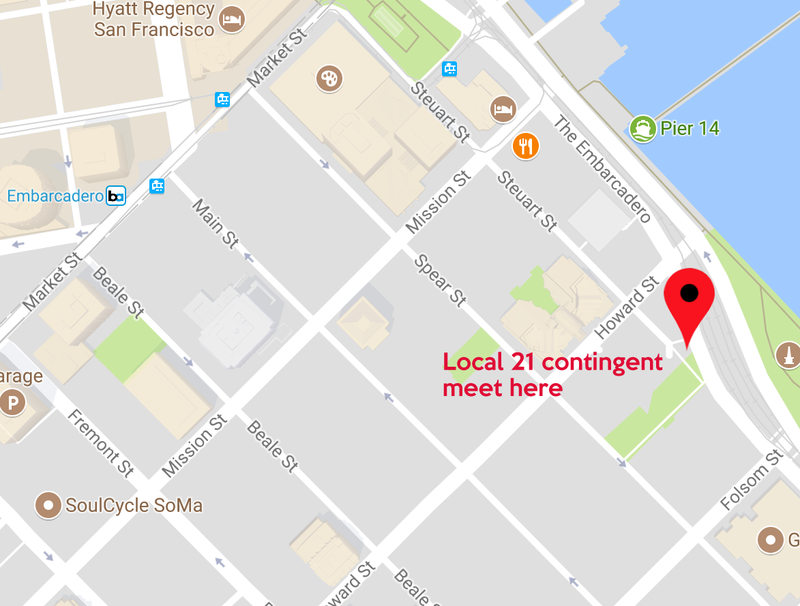 The Local 21 contingent is assigned "Block H, contingent 108." We will be marching with Supervisor Aaron Peskin. The parade runs along Market Street from Beale to 8th. Local 21 will provide t-shirts; email mfuentecilla@ifpte21.org your size. We will also have water and snacks on-hand. The parade runs along Market Street from Beale to 8th. Portable toilets are located at the northern end of each block throughout the Assembly Area. Additional portable toilets are located at the Command Center at 77 Beale Street. Bags are highly discouraged, and no bags over 18” x 18” will be admitted. Everyone attending the Celebration must pass through the screening process. All items will be subject to inspection at the entry gates, and there are no lockers for storage of oversized bags. Any item deemed inappropriate or hazardous by law enforcement and/or security.